Medusa is powerful flash tool for boot death recovery for LG, Samsung,Huawei and other Qualcomm based Phones.This tool will make the work of JTAG More Easy and friendly for users and having full support of smart phones boot file repair via JTAG pin out. Medusa Team doesn't forget to add support for devices You can requested add models to Repair Boot. and continues to deliver the most requested solutions on the market. Easy and smart User Interface suitable for beginners and for experts. NAND, OneNAND, NOR and eMMC storage devices are supported via JTAG interface, Up to 1 MB/s transfer rate. NAND, OneNAND and eMMC storage devices are supported via USB interface. Fast repair of target device with Smart-Repair-Files (SRF). 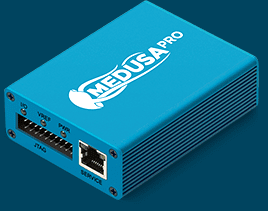 Full-featured professional-grade Medusa PRO software supports all operations with any required memory sections through JTAG, USB and MMC interface. Nokia Lumia 635 (RM-975), Samsung Galaxy Win Pro SM-G3812, Samsung Galaxy E5 SM-E500H via eMMC and support for LG US991 and Asus ZenFone 2 (Z00LD) via USB. Released support for "Qualcomm MSM8939" core (general QC USB loader added). Read/Write/Full Erase operations are supported. Added support for the following models via USB. Asus ZenFone 2 (Z00LD) - Read/Write/Full Erase, Easy Repair, Partition Manager, Constructor for Repair Files.